While a few sensational murders have taken place in Porter County, Indiana, one of the strangest homicides concerns an unnamed man; a murder that was brought to light decades after it had taken place. The peculiar nature of this murder story seems to support poet and playwright William Congreve's famous passage "Heaven has no rage like love turned, Nor hell a fury like a woman scorned" from the play The Mourning Bride. Wants to Collect Alimony On Old Decree. From the lips of a strange old lady, people in the county clerk's office yesterday heard a strange tale of the olden time, and although the woman may be demented, part of her story, at least, is true, as the court dockets disclose. 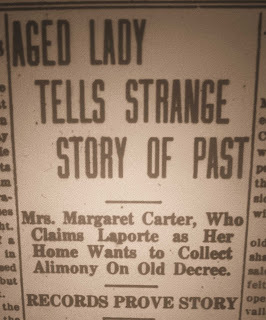 Mrs. Margaret Carter was the name the woman gave, and she claimed Laporte as her home. James Gibbins, her first husband, after thirty-nine years' absence in California, is now living at Hanna, the woman said, and she sought means for the collection of $400 alimony and interest of nearly a thousand dollars. By the Laporte woman's side stood a silent man during her disclosure. G. E. Bornholt heard the story of the divorce. Then he went into the lower vault of his office and dug from the records the proceedings of the old case. Mrs. Gibbins was allowed $400 alimony, the custody of the child, and a sheriff's sale was ordered that she might obtain her third of the farm implements and the crops. John Dutton was named as garnishee defendant. Judge H. A. Gillett ruled in the woman's favor. This is all that can be ascertained from the docket. The rest of the story is from the lips of the old lady, who may be demented, her audience believed. Soon after she was granted her decree and judgment, Gibbins fled with the child and the alimony, she related, and her claim has never been satisfied. In California, he made money, and now, in his old age, he has located at Hanna. She has seen him there, conversed with him, and made the demand for the money. She also inquired about the child, who is dead, Gibbins is said to have told her. When the woman failed to get much satisfaction at the clerk's office she went to deputy prosecutor F. B. Parks and demanded the arrest of her divorced husband. All of the old court case was rehearsed for his benefit, and then Mr. Parks listened to an allegation that gave a shock to his senses. Gibbins murdered a peddler, and all these years she has kept it a secret for his sake, she declared. The deputy prosecutor decided instantly that his informant was insane, and turned himself away, advising that she see the regular prosecutor, Charles Jensen. The peddler remained over night at the home; her husband discovered he had a roll of money, took the peddler's life, buried the body, and the wife washed the blood from her husband's clothing. This is what the strange old lady, who claimed Laporte as her home, told the deputy prosecutor. The Gibbins pair had lived at Tassinong. It may be that the long drawn out tale of the Gunness farm may have preyed upon the old lady's brain. Or it may be that she has some faint recollection of John Dutton, mentioned in her former complaint. Dutton was himself murdered, an old resident claimed today, and his murderer served a prison term for the deed. Front page headline from The Porter County Vidette, November 29, 1916. 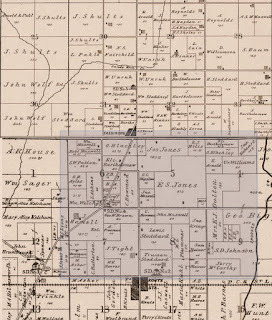 A John Dutton was murdered in Porter County, his demise having taken place on November 11, 1880, in Pleasant Township, extremely close to where James and Margaret Gibbins once resided. Dutton was 59 years of age, five feet and six inches in height, and reportedly heavy built. 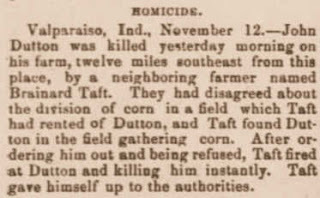 Interestingly, newspapers from the local area failed to cover the Dutton murder, but a short coroner's inquest notice appeared in the November 25, 1880, issue of the The Porter County Vidette. This notice incorrectly states that Dutton was murdered by Joseph Taft; the murderer's name was Brainard Taft. At the time of the incident, Taft was renting land from his neighbor, Dutton. Taft had planted the rented land in corn and a dispute over the division of the crop later ensued. The two men reportedly quarreled over the crop for several days; Dutton's rent was very likely based on this split of the corn crop. 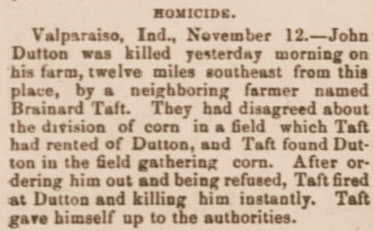 Taft later found Dutton in the field gathering corn and ordered him to leave. Dutton refused to obey the command, whereupon Taft fired his gun at Dutton, killing him instantly. Taft immediately traveled the twelve miles north to Valparaiso to give himself up to the Porter County sheriff. Dutton at the hands of Brainard Taft. Bourbon County, Kansas, November 13, 1880. Taft claimed that he shot Dutton in self defense. This claim seems to have had some merit since Taft was sentenced to served only four years at the Indiana State Prison in Michigan City for his crime. John Dutton is interred in the Adams Cemetery in Morgan Township. What happened to Taft after serving his prison sentence? A search of numerous genealogy databases makes it appear that he simply vanished, as no records could be found concerning Taft. The "tale of the Gunness farm" mentioned in the column refers to the infamous Belle Gunness murders, which coincidentally took place very near to where Margaret was living in the city of LaPorte. The Gunness story culminated in an inferno burning down the Gunness home and the discovery of numerous bodies in April 1908. "It was for the sake of my boy that I did not reveal the crime at the time of the commission, but conscience will not permit me to longer remain silent, and I now want the mystery of that crime cleared up and to know whether my boy, now grown to manhood, is alive, that I want investigation made." Laporte, Ind., Dec. 2. -- The woman who startled Valparaiso Wednesday by telling a tale about how her former husband murdered a man at Tassinong, a neighborhood south of Valparaiso, 39 years ago, is none other than that Mrs. Margaret Dempsey of this city, wife of James Dempsey, a teamster, of 328 Pine Lake avenue. Why she should go to Valparaiso and tell her story to the circuit clerk is not known, unless it is because it was there she secured a divorce from her former husband, James Gibbons, in 1877. Evidently she seeks to force collection of this alimony and interest which would amount now to about $1,400, and her story may be used to force Gibbons, said now to be in Hanna, Laporte county, to pay up. Mrs. Dempsey filed suit to collect this money in the circuit court here no longer than October 3 of this year. Of course, nothing is said in the complaint filed about the alleged murder. She merely declares that the alimony is due her, and with interest, and asks judgment for $2,500. This suit was filed by Attorney E. E. Weir. Mrs. Dempsey has told her story to other attorneys here and some of them, at least, declared her claim was now outlawed through lapse of time. Mrs. Dempsey's story about the murder has received some credence here, due to the fact that she tells it much in detail and is said always to tell it the same. The difficulty about her murder story is that if it is true there probably is no way to prove it. She says that on October 8, 1876, shortly after her marriage to Gibbons, and while living with him on a farm near Tassinong, a strange man looking for work came to their home and stayed over night. Her husband directed him the next morning, she said, to another farm where he would be able to get work. He directed him through the woods, which she thought strange at the time. The stranger had with him a wallet with a large amount of money. Mrs. Dempsey, then Mrs. Gibbons, went out of the home some time after and came suddenly upon her husband sitting on a log by the hog pen. He had the stranger's wallet in his hands and was counting the money from one knee to the other. She slipped from a log on which she stood and he saw her and, rushing forward, grasped her by the throat. She admonished him not to kill her, she says, for her sake and the sake of their unborn child, and Gibbons then broke down and cried and told her he had killed the stranger and had done it for her sake and their child's sake, and made her swear never to reveal the crime. She claims that after she secured a divorce, Gibbons kidnapped their child and went to California and has lived there since. She alleges he is now worth $30,000 to $40,000. Although It Is Suspected Informant Is Unbalanced. 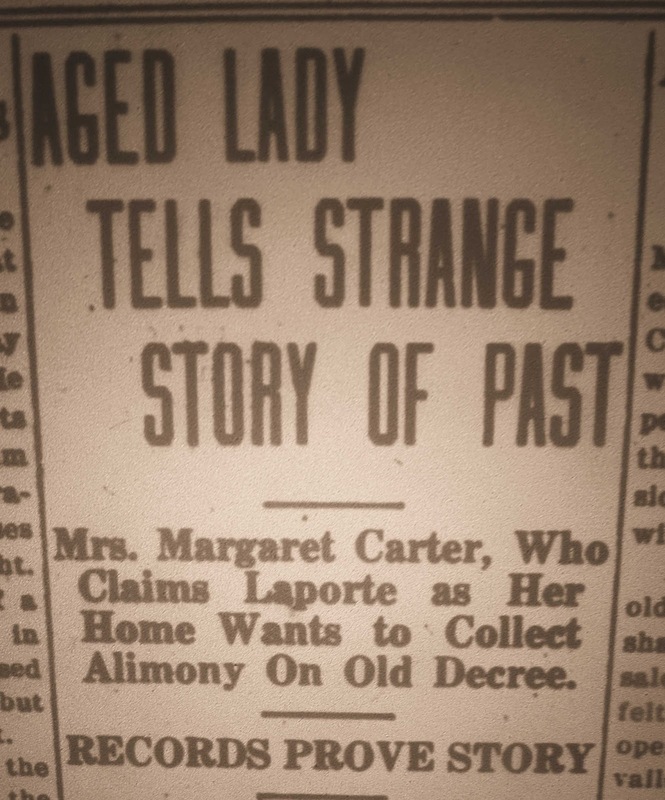 A woman 72 years old, giving her name as Margaret Reagan and her residence as Laporte, told a startling story Tuesday afternoon when she called at the county clerk's office in Valparaiso to look up the records showing that she had been granted a divorce and alimony 39 years ago from her first husband, James Gibbons, who immediately fled to California without settling the alimony allowed her by the court. She said that Gibbons had recently returned to the state, and that he was living at Hanna, this county. It was her purpose to collect the alimony and interest. The allowance was $400 and this, with the interest, is now in excess of $1,400. The statement which caused a sensation among the officials she met was the the effect that, a few years before the divorce was granted, her first husband killed a peddler who had stopped by their home for the peddler's money. At the time of the alleged murder, the former Mrs. Gibbons and her husband were living at Tassinong, a Porter county village that has passed out of existence. Although it was suspected that the woman was mentally irresponsible, the prosecutor said that it was his purpose to make an investigation. The woman claimed that she had never told the story before, saying that she had kept silent "for the sake of their son." According to her story she had been married to Gibbons several years when, on Oct. 8, 1876, a stranger, a traveler, stopped for lodging and stayed for two days. When he left, so the woman asserts, her husband followed and killed the man, who it was found had several hundred dollars on his person. A divorce followed a year later in the Valparaiso court, and then the man by contempt of court stole the only child and skipped to California, where he has been for nearly 40 years, returning only a little more than a week ago and settling at Hanna. After she and Gibbons had been married a number of years, family trouble arose, and Mrs. Gibbons petitioned for a divorce, in 1877, before Judge H. H. Gillette. The divorce was granted, with an allowance of alimony. A sheriff's sale of the farming implements and grain was ordered. According to the records there were plows, corn planters, cows, 18 head of pigs, several bushels of grain, etc., which was accordingly sold at sale. However, according to her story, Mrs. Gibbon's husband, after the divorce, secured the money from the sale, stole the child and left for California. She claimed that since his return to this county she had met him, and that he told her that the son he took with him to California had died. After telling the clerk about the alleged murder she repeated the story to the prosecutor. After the man had committed the murder, according to his former wife, he tried to get his wife to clean the blood stains from his clothes. She refused, but he forced her to do so. The man was was murdered, so she says, was a stranger, traveling through the country, and so the murder did not get out as long as she kept it for the sake of the child. Her story that she had been granted a divorce and alimony nearly 40 years ago was found to be true. Clerk G. E. Bornholt, after hearing her story, went into the lower vault of his office and dug from the records the proceedings of the case. The record showed that Mrs. Gibbons was allowed $400 alimony and custody of the child, and that a sheriff's sale was ordered that she might obtain her third of the implements and crops. Information presented in various newspaper articles lend credence to Margaret Dempsey's tale of murder; many of her alleged "facts" could be verified by search of the existing public records. So who are the characters mentioned in this murder mystery? Margaret Dempsey, the complainant, was born Margaret Forrester in March or April of 1850 in LaPorte County, Indiana. She was the daughter of James Forrester and Lavina (White) Forrester. James Forrester was a native of Roscommon County, Ireland. He arrived in the United States as a poor immigrant in 1818, but accumulated $400 while working in New York. Using these funds, James purchased dry goods and began peddling them in New York. In 1831, he purchased goods in New York and had them shipped to Detroit, where he purchased a wagon and began peddling his goods as an itinerant salesman as far as Ottawa, LaSalle County, Illinois. James then returned to Buffalo, Erie County, New York, where he shipped the first cargo of salt, coffee, sugar, glass, iron, and other goods to Michigan City, LaPorte County, Indiana. James settled in LaPorte and began purchasing real estate, becoming extremely successful in land speculation. By 1860, James had amassed real estate holdings valued at $63,000 and a personal estate valued at $4,500; this would be equivalent to $1.89 million in 2015 dollars. 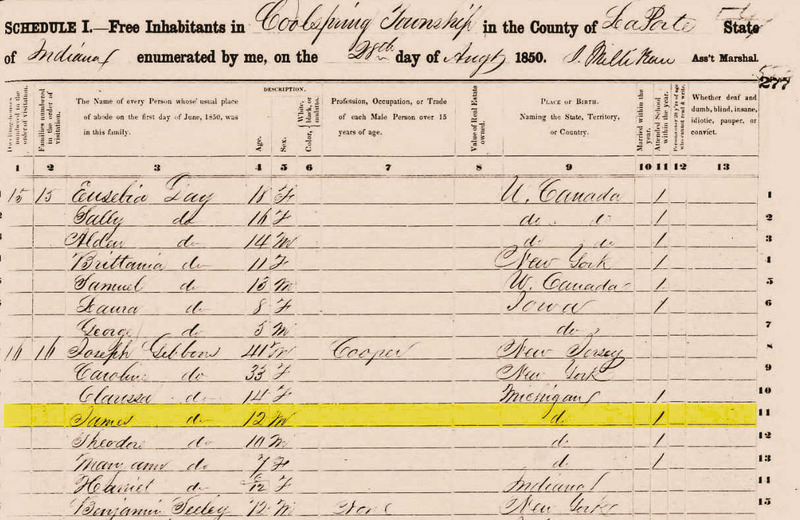 1860 Federal Census, Scipio Township, LaPorte County, Indiana. Considerably less is known of the Gibbins family. It is known that James Gibbins was born about 1838 in Michigan, most likely in Lapeer County. He was the son of Joseph S. Gibbins and Caroline (Seelye) Gibbins, both natives of New Jersey. In August of 1850, the Gibbins family was residing at Coolspring Township, LaPorte County, Indiana, where Joseph was working as a cooper. 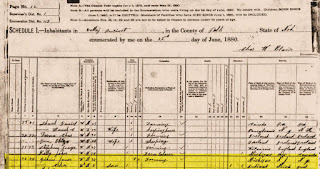 1850 Federal Census, Coolspring Township, LaPorte County, Indiana. In September 1870, Margaret Forrester was living with her parents in Scipio Township in LaPorte County. 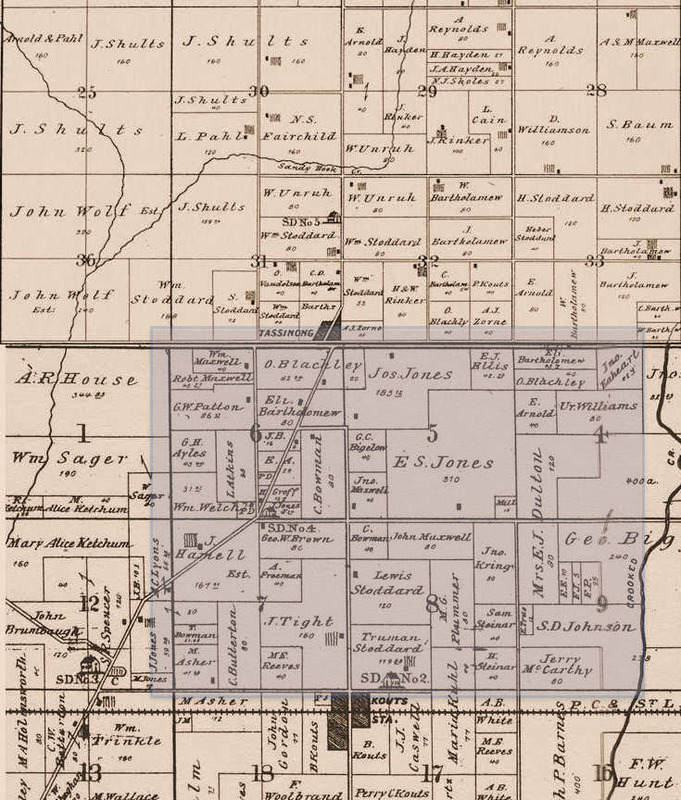 James was residing in Pleasant Township in Porter County, Indiana, in July 1870. Late in 1870, on November 6th, James Gibbins and Margaret Forrester were married in LaPorte County. The circumstances surrounding their acquaintance and marriage is unknown. It is believed that the couple was residing on property located between Tassinong, in Morgan Township, and Kouts, in Pleasant Township, soon after their marriage, most likely in either Section 5, 6, 7, or 8 in Pleasant Township. 1870 Federal Census, Scipio Township, LaPorte County, Indiana. 1870 Federal Census, Pleasant Township, Porter County, Indiana. Was there a son? Yes! A son was born to James and Margaret in St. Joseph County, Indiana, in 1872. Newspaper accounts of the Gibbins murder state that Margaret alleged that James kidnapped their son, moved to California, and built up his assets to an amount between $30,000 to $40,000 by 1916. After exhaustive research, James could not be located in California. Suspected location of the alleged "peddler murder" by James Gibbins. Atlas of Porter County, Indiana, 1876. However, James was found to be living in the Valley Precinct of Polk County, Nebraska, a very sparsely populated county, in June 1880; even today Polk County's population is low at approximately 5,500. And residing with James was a son, Oscar Gibbins. June 22, 1880 - Osker Gibins, age 8 and shown as born in Indiana, was residing with his father, James Gibins, in Valley Precinct, Polk County, Nebraska. 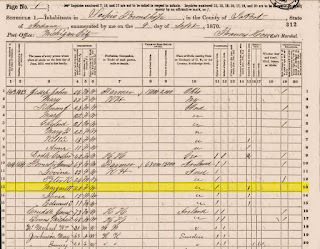 Interestingly, the census record does not provide an indication as to whether James was married, widowed, or divorced, though there is a space to indicate this particular information on the 1870 federal census form. 1880 Federal Census, Valley Precinct, Polk County, Nebraska. 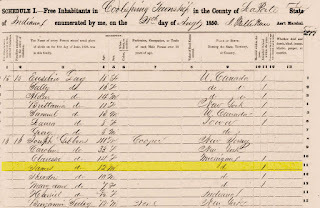 June 5, 1885 - Oscar Gibbins, now age 14 and shown as born in Indiana, was still residing with his father, James Gibbins, a farmer, in Valley Precinct, Polk County, Nebraska. 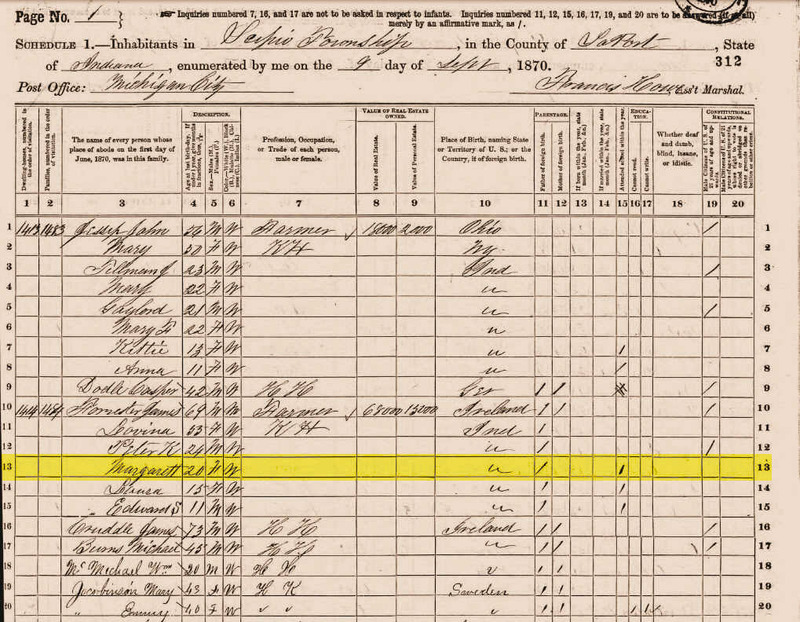 Similar to the 1880 federal census, the Nebraska state census form for 1885 provided a space to indicate whether James was married, widowed, or divorced; this space was left blank in James' enumeration. 1885 Nebraska State Census, Valley Precinct, Polk County, Nebraska. May 16, 1910 - Oscar Gibbons, age 38, single, and shown as born in Indiana, was residing in the Columbia Precinct of Benton County, Washington. 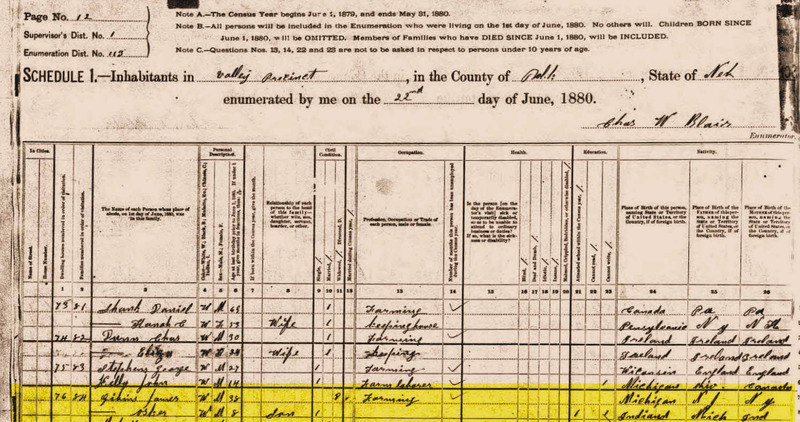 The federal census record indicates that Oscar was working as a farmer when the enumeration was taken. 1910 Federal Census, Columbia Precinct, Benton County, Washington. January 12, 1920 - Oscar Gibbins, age 47, single, and shown as born in Indiana, was residing at a hotel owned by Harvey and Ida Lichty in Sunnyside, Yakima County, Washington. He was occupied at this time as a dealer in wood and animal hides. 1920 Federal Census, Sunnyside, Yakima County, Washington. April 15, 1930 - Oscar Gibbons, age 57, single, and shown as born in Indiana, was still residing in Sunnyside, Yakima County, Washington; he was living with the family of Roscoe and Alma Jeffres and was employed as a potato buyer. 1930 Federal Census, Sunnyside, Yakima County, Washington. May 1940 - Oscar Gibbins, age 68, single, and shown as born in Indiana, was residing alone in Alfalfa, Yakima County, Washington, about two miles southeast of Toppenish. He was employed as a farm laborer. 1940 Federal Census, Alfalfa, Yakima County, Washington. August 11, 1952 - Oscar Gibbins died in Sunnyside, Yakima County, Washington. Oscar was buried in Arlington Municipal Cemetery in Arlington, Snohomish County, Washington. He shares his grave site with W. David Tungate. One publicly available genealogy indicates that Oscar married Mary Virginia Daniel, a divorced mother of four children, on St. Valentine's Day in 1896. This marriage cannot be verified, and census records from 1910 through 1940 do not provide evidence of a marriage (or divorce). Oscar died in Yakima County, Washington, which is located on the east side of the Cascade Range, yet he was buried 200 miles northwest in Snohomish County, Washington, which is on the west side of the Cascades. It is speculated that Oscar died a bachelor and was buried in the Arlington Municipal Cemetery since he had other Gibbins relatives living in the Arlington area, some of whom are also interred in this particular cemetery. Apparently, Oscar followed an investment strategy that was similar to his maternal grandfather, James Forrester of LaPorte County, Indiana. Oscar invested in real estate in several locations in Washington: Skagit County in 1906 (near Arlington), Okanogan County in 1920, and Yakima County in 1924. Whether he became wealthy like his grandfather is unknown. Turning back to the the murder of a peddler in Porter County, what happened after Margaret divulged the incident to Porter County authorities? Perhaps nothing. Following the reports that the Porter County prosecutor's office would investigate Margaret's claims, one would have expected there to be published accounts about the results of the investigation. There are none. Newspapers are silent about the case. In 1917, Margaret Dempsey brought suit against James Gibbins in the LaPorte Circuit Court. Gibbins, however, had a change of venue grant and the case was instead tried in the Porter Circuit Court. Gibbins had argued the Margaret wielded undue influence over the people of LaPorte, thereby affecting his ability to receive a fair and unbiased trial. Dempsey's attorney was E. E. Weir, while Gibbins was represented by Sutherland and Smith. According to the 1920 Federal Census, Margaret and James Dempsey were still residing in the city of LaPorte. James Gibbins cannot be located in genealogical records after 1916. It is known, however, that James Gibbins was never a resident of the Indiana State Prison, which suggests that he was never convicted of murdering the peddler as alleged by his ex-wife. One is also left wondering if Margaret ever reunited with her son, Oscar? Or did Margaret pass away in the belief that her son had died, as James Gibbins had told her? Did James tell Oscar as he was raising him that his mother was dead? By 1910, Oscar was living in Benton County, Washington, so tracing him would have been difficult, time consuming, and costly. And given the long passage of time between the alleged murder and the notification of it to authorities, perhaps the Porter County prosecutor truly believed Margaret to be either insane or suffering from dementia. Alternatively, James Gibbins may have gotten away with murder.... And who was the peddler? Please leave a comment if you can provide additional information to this tale. Bureau of Land Management, Land Patents, Spokane District Office. Land patents granted to Oscar Gibbons: WASAA 059930, WAWA 0015055, and WAORAA 048028. The Indianapolis News, Indianapolis, Marion County, Indiana; November 12, 1880; Volume 11, Number 289, Page 2, Column 6. Column titled "State News." The Daily Fort Scott Monitor, Fort Scott, Bourbon County, Kansas; November 13, 1880; Volume 17, Number 139, Page 1, Column 1. Column titled "The Latest News. By Telegraph. Homicide"
The Porter County Vidette, Valparaiso, Porter County, Indiana; November 25, 1880; Volume 24, Number 48, Page 2, Column 5. Public notice titled "Report of Coroner's Inquest." The Porter County Vidette, Valparaiso, Porter County, Indiana; November 29, 1916; Page 1, Column 5. Column titled "Aged Lady Tells Strange Story of Past." The Porter County Vidette, Valparaiso, Porter County, Indiana; May 2, 1917; Page 3, Column 4. Column titled "Gibbins Prefers To Fight Lawsuit In This County." South Bend News-Tribune, South Bend, St. Joseph County, Indiana; December 1, 1916; Volume 33, Number 336, Page 3, Column 2. Column titled "Tells Story of Ancient Murder. Divorced Wife Claims Husband Killed Peddler Back in Early Seventies." The Chesterton Tribune, Chesterton, Porter County, Indiana; December 7, 1916; Volume 33, Number 38, Page 1, Column 5. Column titled "Parks Will Probe Farm Mystery." The Chesterton Tribune, Chesterton, Porter County, Indiana; December 7, 1916; Volume 33, Number 38, Page 1, Column 6. Column titled "Tell Murder Story to Valpo Officials. Laporte Woman Claims Her Divorced Husband Killed Man Years Ago." The Porter County Vidette, Valparaiso, Porter County, Indiana; December 6, 1916; Page 2, Column 1. Column titled "Identity of Woman With Strange Story." This article from the Herald-Argus concerns the James Forrester house on Hwy. 2, West of LaPorte. I'm not sure if this is the same family.